After breakfast, proceed to Munnar, the place where the unfolded green carpet is waiting for you. Munnar is breathtakingly beautiful, a haven of peace and tranquility - the idyllic tourist destination of Kerala. Munnar is the gateway of Hills in South India. Enroute watch the lovely waterfalls in Cheeyappara and colourful flowers in Blossom Garden. Overnight stay at Munnar Hotel/Resort. After breakfast proceed for a morning sightseeing trip of Munnar; visiting the Eravikulam National Park where you can see the very rare mountain goats natively called the NilgiriTahr. Visit Tea Museum and Mattupetty Lake & Dam &KundalaLake.Enroute visit Echo Point, View Point & green carpet of Tea Gardens. Overnight stay at Munnar Hotel/Resort. 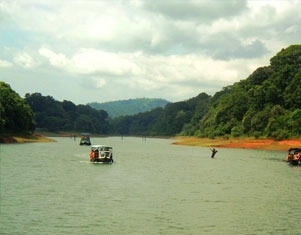 After breakfast proceed to Thekkady which offers diverse attractions like Periyar Wildlife Sanctuary, Hill Station and Spice Plantation. Here you can go for a Wildlife cruise to view a large variety of wildlife like Wild Elephants, NilgiriLangur, Sambar Deer, Wild Bison and quite a lot of unique birds can also be spotted. You can recreate yourself by indulging in optional (chargeable basis) activities like Spice Plantation Tour, Bamboo Rafting, Trekking and Elephant ride. Overnight stay at the Hotel/Resort. After breakfast, check-out and proceed to Alleppey. Alleppey with a large network of inland canals earning it the sobriquet "Venice of the East". These large networks of canals with spectacular Backwaters, Beaches, Marine products & Coir industry provide Alleppey its lifeline. Evening enjoy the sunset at Alleppey Beach. Overnight stay at Alleppey Hotel/Resort. If Houseboat Stay: After breakfast proceed to Alleppey boat Jetty, board the traditionally decorated houseboats and begin the enchanting backwater cruise. The backwaters of Kerala is a unique product of Kerala and is found no where else in the world. A glide in a "Kettuvallam" (Houseboat) through the enchanting backwater is sure to rob your heart. Lunch, Dinner & Overnight stay at Alleppey Houseboat. After breakfast, check-out and proceed to Kovalam beach. Kovalam is known as the "Paradise of the South". Visit the crescent shaped beaches of Kovalam i.e. Samudra Beach, Hawa Beach & Lighthouse Beach. With high rock promontory and a calm bay of blue waters, this beach paradise creates a unique aquarelle on moonlight nights. Overnight stay at Kovalam Hotel/Resort. After breakfast proceed for the full day sightseeing of Trivandrum. The temple of Anantha, the Sri Padmanabhaswamy temple is the most religious icon of the city. Other sightseeing places are Trivandrum Zoo, Srichitra Art Gallery, Veli Tourist Village and Shangumugham Beach where one can watch the amazing sunset. Overnight stay at Kovalam Hotel/Resort. After breakfast pack your baggages with a promise to return once again to this Paradise. Check-out and proceed on time to board your flight/train with sweet memories of your holidays. We await for your next visit. Bon Voyage. Service ends.